to Epsilon Eridani at left center of meteor). Today, many astronomers refer to this star as HD 156668, as designated in the Henry Draper (1837-82) Catalogue with subsequent extension (HDE), a massive photographic stellar spectrum survey carried out by Annie Jump Cannon (1863-1941) and Edward Charles Pickering (1846-1919) from 1911 to 1915 under the sponsorship of a memorial fund created by Henry's wife, Anna Mary Palmer. However, it was probably first designated as BD+29 2979 a catalogue that was originally published in 1863 by Friedrich Wilhelm August Argelander (1799-1875) on the position and brightness of 324,198 stars between +90° and -2° declination that were measured over 11 years from Bonn, Germany with his assistants Eduard Schönfeld (1828-1891) and Aldalbert Krüger (1832-1896). The catalogue became famous as the Bonner Durchmusterung ("Bonn Survey") and is typically abbreviated as BD. It was later expanded and extended during the early 20th Century with the Cordoba (observed from Argentina) then the Cape Photographic Durchmusterung (observed from South Africa). The high proper motion of this star may have been first detected in a series of proper motion surveys first published in 1957 of 9,867 stars in the Southern Hemisphere and updated in supplements. The star was designated in the Luyten Two-Tenths catalogue as LTT 15121 by Willem Jacob Luyten (1899-1994). It was also detected during the Lowell Proper Motion Survey of the Northern Hemisphere begun in 1957 by Henry Lee Giclas (1910-2007), Robert Burnham, Jr. (1931-93), and Norman G. Thomas at Lowell Observatory and designated as G 181-34 in the Giclas catalogues of faint proper motion stars (Giclas et al, 1971). HD 156668 is a main-sequence, orange-red dwarf star of spectral and luminosity type K2-3 V. The star probably has a mass somewhat smaller (around 72 percent) than Sol's (NASA Star and Exoplanet Database, derived from David F. Gray, 1992), and it appears to have only around 75 percent of its diameter (NASA Star and Exoplanet Database, derived from Kenneth R. Lang, 1980). Most revealing, HD 156668 only has around 27 percent of Sol's bolometric luminosity (NASA Star and Exoplanet Database, derived from Kenneth R. Lang, 1980). It appears to be around 85 percent as enriched as Sol in iron relative to the abundance of hydrogen (Mishenina et al, 2008). Useful catalogue numbers and designations for the star include: G 181-34, Hip 84607, HD 156668, BD+29 2979, SAO 84984, LTT 15121, and 2MASS J17174049+2913378. 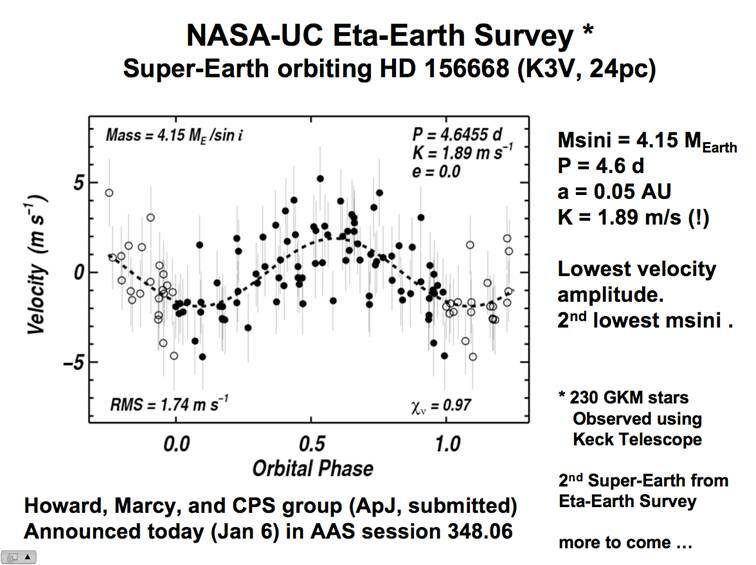 On January 6, 2010, a team of astronomers announced their discovery of a "super-Earth" class planet in a tight orbit around this star (Keck press release). 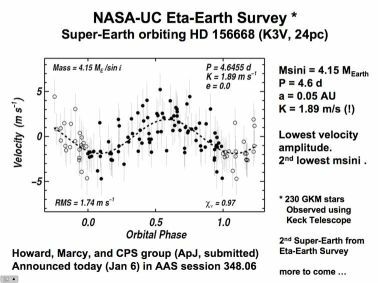 Planet "b" has at least 4.15 Earth-masses and orbits HD 156668 at an average distance of around 0.05 AUs in a period of just over 4.6 days. The planet has a highly circular orbit (e~ 0). 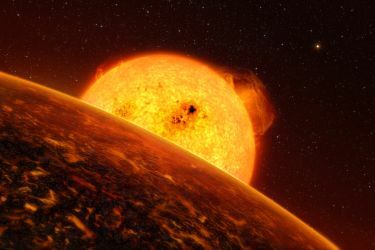 It was found using radial-velocity measurements obtained as part of the the NASA-UC Eta-Earth Survey by the California Planet Search (CPS) group, a systematic search for low-mass planets between three and 30 Earth-masses orbiting the nearest 230 G-, K- . and M-type stars suitable for high-precision Doppler observations at the Keck Observatory. [More details will be forthcoming in Howard et al, 2010]. The following table includes all star systems known to be located within 10 light-years (ly), plus more bright stars within 10 to 20 ly, of HD 156668. Up-to-date technical data on these stars may be found at: Jean Schneider's Extrasolar Planets Encyclopaedia; the Astronomiches Rechen-Institut at Heidelberg's ARICNS, the NASA Star and Exoplanet Database, the HIPPARCOS Catalogue; NASA's ADS Abstract Service for the Astrophysics Data System; and SIMBAD. In Greek mythology, Hercules was the son of the God Zeus and the Alkmene, the wife of Amphitryon who was fooled by Zeus into believing that he was Amphitryon. Hera, the wife of Zeus, somehow arranged that the first born son of Alkmene became Eurystheus, who under Hera's influence eventually gave his half brother twelve tasks to complete or perish. For more information about the stars and objects in this constellation and an illustration, go to Christine Kronberg's Hercules. For another illustration, see David Haworth's Hercules.